- As party stronghold tears… - Regional chairman kidnapped…. 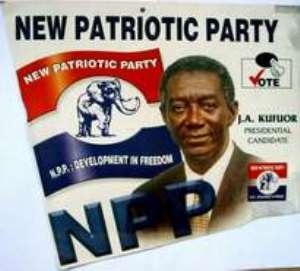 Perhaps for now the ruling New Patriotic Party (NPP) would have to concentrate its activities on how to restore sanity within the party before taking steps to deal with any challenges from its opponents as the party continues to witness infighting from constituency to constituency. The latest incident of such intra-party confrontation in the NPP has reared its ugly head in the Bantama constituency within the Kumasi metropolis, which is undoubtedly the strongest constituency of the party as far as voting records were concerned. Information available to chronicle indicates that last Tuesday a group of NPP supporters at the Bantama constituency besieged the offices of the regional secretariat of the party also located at Bantama, a suburb of Kumasi, to demand explanation for the removal of the names of some polling station chairmen of the constituency just days ahead of the election of constituency executives. Independent enquiries by the chronicle into the matter indicate that the names of some polling station chairmen in the constituency had been removed by a group of people known as party coordinators who serve as the link between the constituency and the polling station levels of the party. The chairmen of the various polling stations within a particular constituency constitute the delegates who vote to elect constituency executive as well as the election of party parliamentary candidates. The affected chairmen, upon the realization of the deletion of their names from the party's constituency electoral register had petitioned the regional leadership of the party seeking the restoration of their original positions as polling station chairmen and as such legitimate delegates for any constituency level elections of the party. It was gathered that while the grievances of the concerned chairmen were pending redress the leadership of the party in the region went ahead to fix Sunday, June 6 as the date for the election of constituency executives. Provoked by the seeming disregard for the concerns raised in their petition, the concerned chairmen and their supporters stormed the offices of the party on that fateful Tuesday, clad in red arm bands and head gears and bearing placards to insist on the regional executives to give them a hearing as far as the concerns raised in their petition was concerned. The group succeeded in getting the regional chairman of the party, Mr. Fredrick Freduah Anto and other executives to sit on the matter. Sources close to the leadership of the party told The Chronicle that at the meeting the arguments raised by some of the polling station chairmen whose names had been removed were sustained and thus were assured of having their names reinstated in the constituency delegates register of the party. Others however had their cases dismissed for what was considered to be lack of merit. The meeting, which started at around 3: 30pm, ended around 6pm. At this stage the other executive minus the chairman, left the office with the conviction that the matter had been amicably and fairly resolved. But the real action was yet to occur. The chairman who was now alone with the group with the conviction that the matter had been fully settled was, to his amazement, prevented from driving home. The group detained him and physically prevented him from moving his car demanding from him an open declaration that the June 6 constituency executive elections for the Bantama constituency had been postponed. The group was insistent that the open declaration by Mr. Anto was the only price being demanded before his release. The chairman however tried unsuccessfully to explain why the elections could not be postponed. Chairman Anto was at this stage asked by the group to write an undertaking stating in it that the elections were postponed till a further date. This, the chairman did, but it was rejected by the captors on the grounds that it did not bear his official stamp.